Who's who in the Russia-Trump probe? 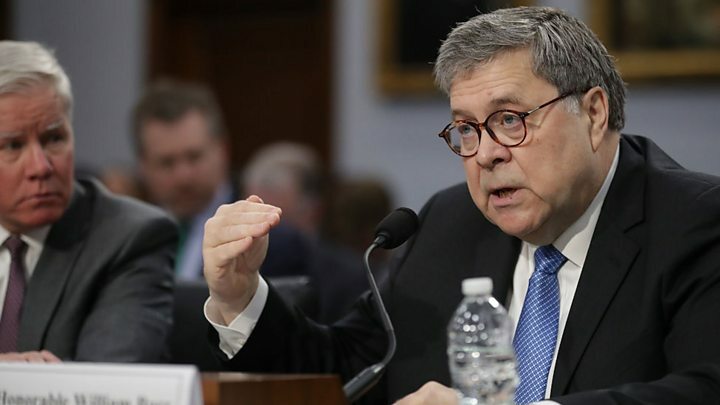 William Barr subsequently backed away from his assertion during Senate testimony that intelligence agencies had been "spying" on the Trump campaign, but that may end up beside the point. An inquiry has been started, and the ball is rolling. The president, however, will surely cite his attorney general's decision as part of his attempt to undermine any unpleasant information that could be revealed when the redacted Mueller report is finally released in the coming days. Even an investigation that reaches no actionable conclusions can have a damaging effect - as the president knows all too well. "I think spying did occur," said the attorney general. "The question is whether it was adequately predicated." He later clarified: "I'm not saying improper surveillance occurred, I am looking into it." He added: "I also want to make clear this is not launching an investigation of the FBI. "Frankly, to the extent that there were any issues at the FBI, I do not view it as a problem that's endemic to the FBI." On Wednesday, Speaker of the House of Representatives, Nancy Pelosi, a Democrat, told the Associated Press: "I don't trust Barr, I trust Mueller." Mrs Pelosi said that appearing to support Mr Trump's views on the alleged spying had undermined Mr Barr's role as attorney general. President Trump and his conservative allies have repeatedly suggested the Obama administration snooped on his presidential campaign to undercut his candidacy. US media reported last year that the FBI sent an informant, an unnamed US academic who teaches in the UK, to speak to two low-level Trump aides, George Papadopoulos and Carter Page, after the agency became suspicious of the pair's Russian contacts. The FBI has previously acknowledged it received a secret warrant in October 2016 to eavesdrop on Carter Page. CNN has also reported that the FBI obtained a warrant in 2016 to listen in on the phone calls of Paul Manafort, who briefly served as Trump campaign chairman, after his Russian contacts aroused suspicion. 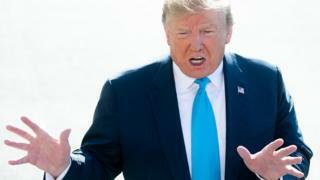 In March 2017, Mr Trump made the explosive claim on Twitter that his predecessor, Barack Obama, had ordered phones at his Trump Tower office to be wiretapped during the 2016 White House race. But the US Department of Justice later said there was no evidence to support the president's claim. The former Director of National Intelligence James Clapper was asked during television interviews in May last year if the FBI had indeed snooped on the Trump team. Mr Clapper told CNN: "The objective here was actually to protect the campaign by determining whether the Russians were infiltrating it and attempting to exert influence."